Chris Cook, chief of environment, energy and open spaces, for the City of Boston spoke to residents regarding the 2019 resiliency study for the North End and Downtown waterfront. 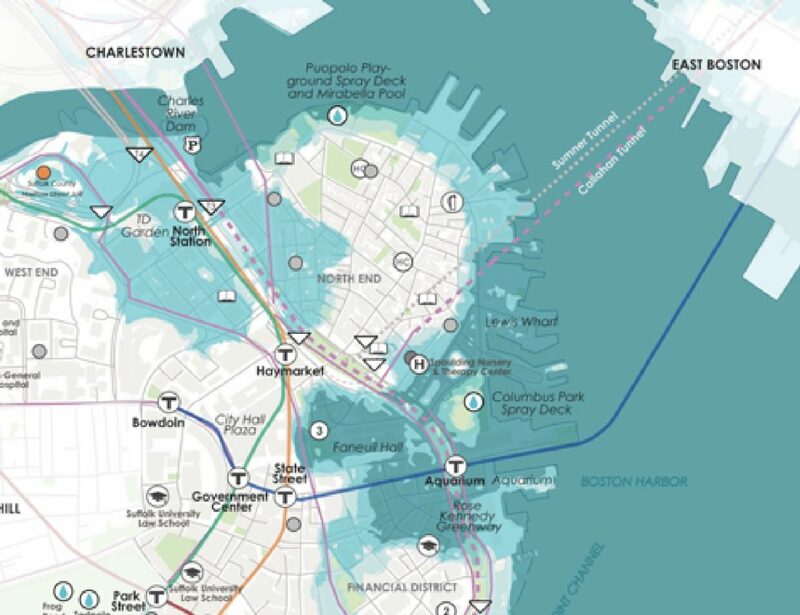 With flooding now a regular occurrence on the waterfront, the Climate Ready Boston initiative aims to prepare Boston for the long-term impacts of climate change and rising sea levels. So far, the City has published reports for the neighborhoods of East Boston, Charlestown and South Boston. This effort was also recently announced as part of Mayor Walsh’s Resilient Boston Harbor vision. Projects in the North End will likely include new designs for Christopher Columbus Park, Langone & Puopolo Parks and Sargent’s Wharf. Other areas needing attention include Long Wharf, the New England Aquarium and the overall Harborwalk stretch from the North End into Downtown. At 08:30 in the video, Alisha Pegan presented planning specifics for the North End and Downtown study. Discussed were the flooding maps under varying scenarios of climate change. In addition to traditional seawalls to prevent flooding, city officials are looking at living barriers, stepped edges, stormwater gardens, elevated pathways and coastal marshes. City-owned parks and open spaces are directly in the city’s control, however, Cook emphasized the jurisdictional challenges with implementing resiliency methods especially on private property. The neighborhood climate report is unlikely to dictate new regulations, but rather provide guidelines and options for vulnerable areas. Resident questions were fielded by officials at the 20:00 minute mark in the video. In particular, an extensive discussion of tree benefits can be viewed at 33:20. View the above video for the complete presentation by Commissioner Cook and project manager, Alisha Pegan. Also see the launch event video for the Climate Ready study for the North End and Downtown waterfront.